Eklavya School Admission, EMRS Admission,: Eklavya Model Residential School released admission notification on its official website. Eligible and aspirant students may apply for GSTES Eklavya Model Residential School Admission, EMRS Class- VI Admission on its official website. All information regarding admission, qualification, age and other available on this page below. The Eklavya Model Residential School will be going to conduct entrance test for admission academic year. Eligible students may apply online through official website. The process for applying for Eklavya Model Residential School Admission Selection Test has been simplified through online process. Students are advise to read all information regarding admission, selection test and other information on this page below. Ekalavya Model Residential School EMRS is a Government of India scheme for model residential school for Indian tribals (Scheduled Tribes, ST) across India. EMRS established by the Tribal Ministry, Government of India. Gujarat State Tribal Education Society (GSTES) or EMRS Society came into existence on 3rd January, 2000 as an autonomous society by Tribal Development Department, Government of Gujarat. GSTES is formed for establishing, maintaining, controlling and managing good quality schools for talented and meritorious ST students. The society is currently running three types of schools called Eklavya Model Residential School (EMRS), Low Literacy Girls’ Residential School (LLGRS) and Model Schools (MS) across the state. Scheduled Tribes (ST) cast students may apply for this admission entrance exam. Students have to study in 5th Standard in Government Primary School, Ashram School or Grant in Aid school and cleared 5th standard at the time of admission. Not More than 13 years old. The selection test will be of two-hour duration with only objective type questions. 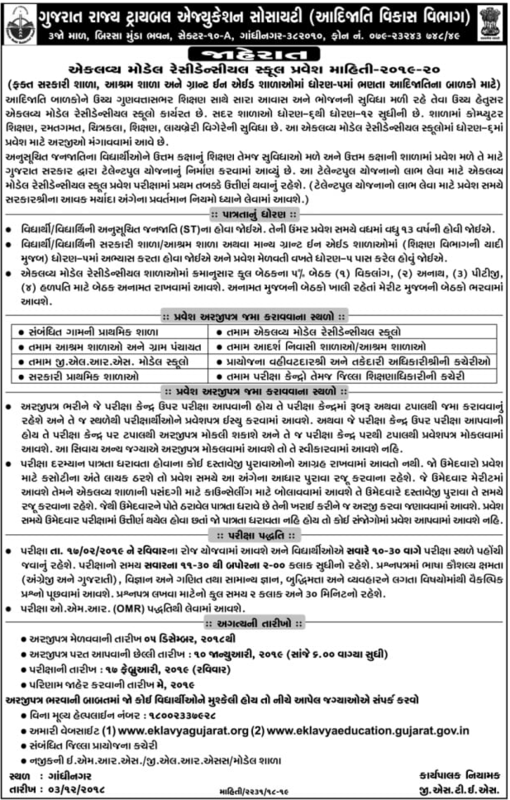 Gujarat State Tribal Education Society (GSTES) recently released latest admission notification for academic year of 2019-20. Eligible and aspirant students may apply online through online mode. Eklavya Model School invite students for admission in Class VI. Eklavya School Admission test will be held on 17th February, 2019 (Sunday). Application form available from 5-12-2018 and last date for submit application form 10-01-2019. Candidates are advise to bookmarks this page and be regular touch on this page for get more latest updates about Eklavya School Admission 2018-19.